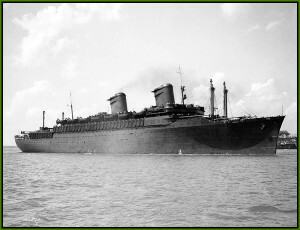 America after her conversion into the troopship USS West Point. The US Navy acquired United States Line’s America on 1 June 1941 for conversion into the troopship USS West Point (the name of the US Army military academy, located in West Point, New York). Over six months before the US entered World War II, on 6 June 1941, West Point returned to her builder, Newport News Shipbuilding and Drydock Co., for conversion. By the time the refit was completed, life rafts hid the promenade deck windows, all other windows were covered over, and “standee” bunks were installed throughout the former liner. Several anti-aircraft weapons were mounted and the ship was painted camouflage gray. West Point’s troop-carrying capacity was 7,678.